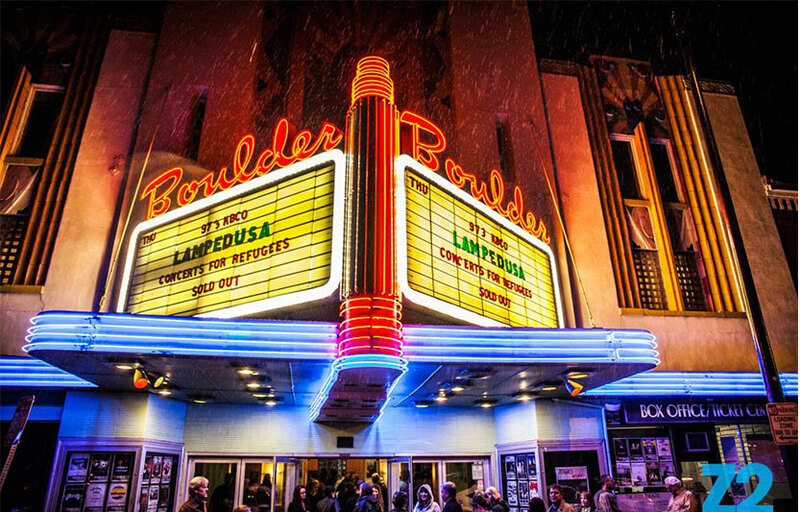 Today, the Boulder Theater truly is an all-around entertainment venue: live music of all genres, film, comedy, spoken word, corporate meetings, tech conferences, and private celebrations to name a few. Policies may vary to fit the needs of the particular event. The Boulder Theatre is one of the more intimate concert venues in Boulder. Just a short walk away from several bars and food options for before or after the event. There is a bar downstairs that you can get beer, spirits, or a soft drink. Where is the Boulder Theater located? The Boulder Theater is located at 2032 14th ST. Boulder, CO. 80302. Parking spots are located off of 14th and Spruce Street, on the north side of the venue. How much is cover charge at the Boulder Theater? Varies depending on the event that night. When is the Boulder Theater open? The Boulder Theater, when they have an event, typically opens at 9:00 pm. What is the dress code at the Boulder Theater? There is typically no dress code at the Boulder Theatre. How much do drinks cost at the Boulder Theater? Expect to pay 12-20 for cocktails. What kind of music do they play at the Boulder Theater? The Boulder Theater has all types of music depending on who is performing. From Hip-Hop to EDM to Country. They also have film showings depending on the night that you can purchase tickets for through the Discotech app. Where can I find a list of upcoming events / DJs at the Boulder Theater? You can download the Discotech app to see upcoming events, and buy tickets for the Boulder Theater.